You will have heard me say in the Horse Magic video above, that all our programs will help you take another step along your path to having the relationship, the healing, the sheer magic seen in this video. You can take one step at a time and build what you need with a variety of programs, clinics both online and in person and support. Everyone can have good health, inner peace, wisdom, confidence, vitality and a zest for life. Horse Magic, with its unprecedented support, is a phenomenal acceleration towards that. It’s the opportunity of a lifetime for those who want to fulfill their goals for horsemanship, riding, knowledge, health and life transformation. Horse Magic is a custom designed, one-on-one Limited Edition program that uniquely blends horsemanship and riding and the health and happiness of both horse and human for phenomenal change. It’s a deeply rich combination of beautiful horsemanship and empathetic riding, mental, emotional and physical healing for you and your horse, health and life coaching – all grounded through the grace of your horse. This 3 month extensively supported program starts with 7 days of one on one horse and health and happiness immersion at either your place or mine. This is your chance to design your dream clinic/retreat – whether that’s working with you and your horse on your home turf or experiencing the Magic of an incredibly empowered herd of horses here at my home. Together we’ll create a plan for your Horse Magic. Then you get unprecedented support from me with 12 weekly private sessions/lessons. These will be live lessons with video and sound technology that enables me to see what you’re doing and us to talk together while you’re working, no matter where you are in the world. We can also access any other lessons from my extensive library of 100’s of hours of horsemanship, riding and wellbeing lessons. Who is Horse Magic for? It’s for someone who is looking for big change – for transformational change – and wants it now. Horse Magic is for people of all ages, shape, size, fitness level and any level of horsemanship ability/experience. And your horse could be a baby in years or training level, an elite competitor or have health and/or behavior “problems”. Every one of the special people in the Horse Magic video above would consider themselves to be an ordinary person. And yet clearly, as they uncovered their natural talent and gifts, they were extraordinary and got extraordinary results. That’s Horse Magic. Horse Magic starts with a private, custom designed 7 day immersion in horses, health and happiness at your place or mine, with your horse or mine. This is your chance to get your perfect clinic/retreat, designed specifically for you and flexible to you and your horse’s needs in the moment. The seven day part of the program will be a Retreat consisting of 5 hours a day of working with the horses on the ground, at liberty or ridden, you and your horse’s healing, meditation and life coaching – all especially designed for your horse and life goals. Total immersion in horses, peacefulness, relaxation and joy. If you come to me, there is the choice of accommodation at the luxurious fantasy bed and breakfast Mira Mira just around the corner from us or you can stay here in our home, where you get wrapped up in good, old fashioned Aussie hospitality with beautifully home cooked and chef cooked, mostly organic food. Food limitations and preferences are cheerfully catered for. Then you get 3 months of empowering, energising and focused support. 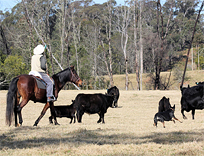 We create a customised, flexible support package that responds to you and your horse’s needs at any given time. Your Horse Magic program comes with 12 follow up private sessions to use for whatever comes up – solve whatever horse “problems” arise, get your riding seat anchored into excellence and learn how to flow that seat into beautiful movement with your horse, healing sessions for you or your horse, health, happiness and general life coaching – whatever you need in the moment, to continue your transformational experience and anchor that progress into your life. You can use those lessons as a weekly support to keep you on track or you can work at your own pace and spread the lessons over a longer period of time. All of our team is available as part of your 12 session support package, should you wish to include any of their specialties into your Horse Magic experience. 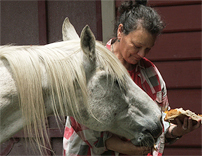 There’s Caroline who combines her highly developed intuition with her knowledge as an Equine Behaviourist, Narel who is a superb animal communicator, shaman, energy healer and astrologer and Holly who combines her extensive horse knowledge with natural practicality and her qualifications as a facilitator in both Epala® and PSYCH-K®. You can read more about our team here. 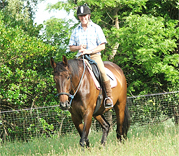 Having someone who gets what you are going through and can draw on decades of alternative health and training work with horses and people to support and help you effectively reach your goals is invaluable – I will be there with you in whatever way works best for you. I have more than 20 years of alternative therapy experience helping horses and humans and their relationship with each other to heal and feel happy, peaceful and safe – to transform their lives. Read more about our team, private sessions and some testimonials. Please note – Horse Magic is a Limited Edition program. There are only 3 places available for me to travel outside of Australia and only 6 within Australia. Are you ready for Horse Magic? Are you ready for a life transformational experience now? Are you ready to put in the time and effort with your horse over a 3 month period and with my support and the grace of your horse to transform your life? Then let’s arrange a pre Horse Magic session to make sure that Horse Magic is in fact the right path for you. We’ll talk about goals, what feels right for you and get an idea of the best path forward for your unique circumstances. This session is strictly private, confidential and commitment free – email me now to arrange your session. Prices vary depending on whether you’re coming here or I’m coming to you, on accommodation and travel arrangements, so when we chat we’ll talk about that too. Whatever your questions and circumstances, you can be confident that there IS a path forward to your Horse Magic.